This is the week where candy fiends and costume lovers get to live out their greatest fantasies. (To an extent.) But be careful that you don’t happen to stumble into the neighborhood where the classic Universal Pictures movie monsters live, because you might not like what they have to hand out, as the excellent video below points out. Think about all the good science fiction out there, and then think about what the genre needs. Project Hieroglyph and author Neal Stephenson believe science fiction needs more “techno-optimism” to pave the way for non-dystopian realities. Some call for more female writers and characters in science fiction; some call for less. But one thing that has never crossed my mind in answer to the question of what sci-fi needs is more Frankenstein spinoffs. 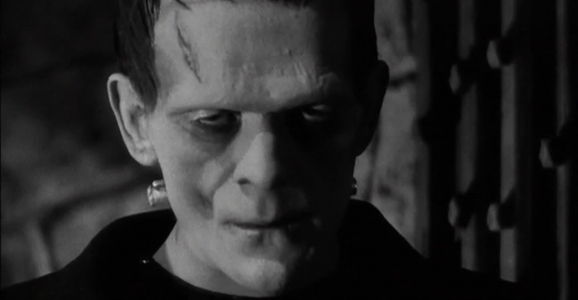 But that’s never stopped anyone before, particularly Fox, which has just ordered a new Frankenstein pilot. 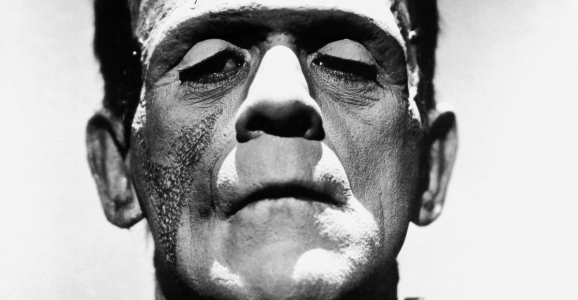 The original Mary Shelley work was written in 1818, and since then there have been a slew of Frankenstein-inspired narratives: Thomas Edison’s 1910 film version; the Boris Karloff 1931 movie; the 1935 sequel, Bride of Frankenstein; the 1939 sequel to that, Son of Frankenstein; Ghost of Frankenstein in 1942; Young Frankenstein in 1974; failed Broadway productions in 1981 and 1984, Tim Burton’s Frankenweenie in 1984; a manga adaptation in 1988; Frankenstein in 1992; Mary Shelley’s Frankenstein in 1994; this year’s bomb I, Frankenstein — and that’s just scratching the surface. Mary Shelley’s Frankenstein may have the stamp of “respectable” literature, but it’s also considered one of the earliest examples of our beloved genre of science fiction. First published anonymously in 1818, Frankenstein; or, The Modern Prometheus beat the works of Jules Verne and H.G. Wells to the punch by decades, and its legacy has inspired countless works and retellings. Over the years, we’ve seen a lot of different looks for Frankenstein’s monster, but the most iconic is easily Boris Karloff’s flat-topped, bolt-necked fella seen up top. 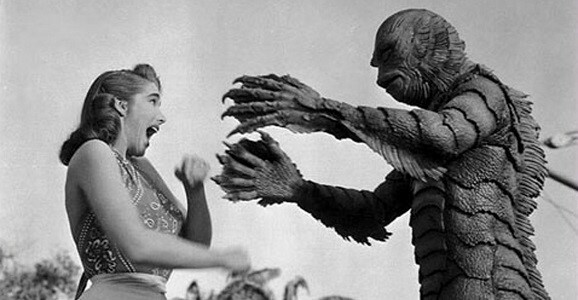 But what did the monster look like in its earliest recorded illustration? More like a fashion model, believe it or not. Toys! Toys! Toys! My adulthood has been plagued by the kind of non-poverty that allows for bills to get paid without any leftover funds to spend on recreational plastic figures. But still, I get a lot of window-shopping done in front of my computer screen. A couple of interesting new announcements made at Comic-Con revealed Mattel is working on a batch of figures based on the classic animated series The Real Ghostbusters, while the big heads over at Funko are creating a line inspired by Universal’s legendary line of movie monsters. Gift giving is allowed on Halloween, right? Any takers? Samhain? Details about Mattel’s line are limited beyond the announcement itself, made over the weekend, and the only other thing mentioned is that they will be coming out in 2015. That’s no big surprise. It’ll be interesting to see what’s different between this line of Real Ghostbusters figures and the awesomely colorful Retro-Action series they released a few years ago. Either way, I’m certain the figures will be amazing. 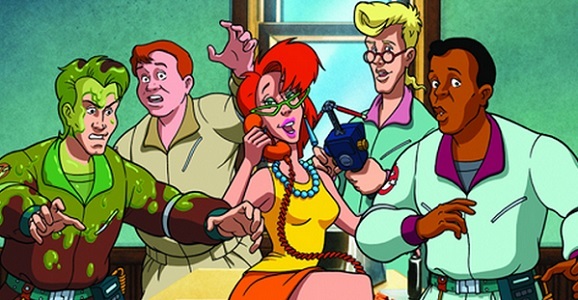 Perhaps they’ll dip into the youth-skewing Slimer! for a Professor Dweeb figure. Man, I miss that show. Moviegoers look at Marvel Studios and see a company that creates films, while other studios look at Marvel and see a hulking pile of dollar bills that aren’t theirs. While there have been some murmurings in the past, Universal Pictures has now officially announced they’ll be creating an Marvel-like interconnected cinematic universe based solely on the horror monsters that helped turn the studio into a powerhouse back in the 1930s. Exciting news, to be sure, but only if they hold off on making the Frankenstein movie until we’re at least five years past pop culture’s current fascination with the cobbled-together creature. To usher in this new era of spooktacular monsters, Universal is bringing in franchise-familiar writer/producers Alex Kurtzman and Chris Morgan. Kurtzman’s name is probably more familiar, as he’s worked with former partner Roberto Orci on the first two Transformers films and The Amazing Spider-Man 2, as well as Universal’s under-performing Cowboys and Aliens. In case you’re thinking, gee, none of those movies were particularly good and wondering if we just cherry-picked bad projects from Kurtzman’s career, you should know that his Rotten Tomatoes page looks like this. It’s not pretty. Morgan, on the other hand, wrote the last five Fast & Furious movies, including the upcoming seventh one, and 47 Ronin, and created the recent Fox series Gang Related.